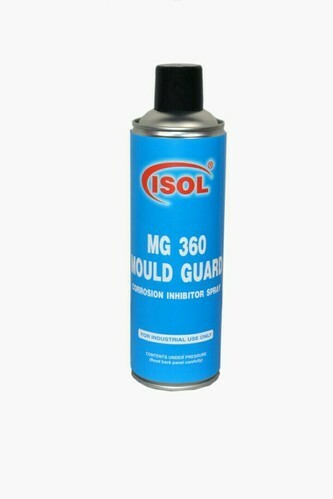 ISOL MG 360 is designed to provide outstanding protection to corrosion prone metal surfaces, against atmospheric corrosion. It builds up a thin, dry, soft film type oily film on metal surfaces, which protect against atmospheric corrosion. Rust and corrosion protection during storage of freshly machined components, Tools, dies, moulds, machine guide ways, keys, shafts, measuring instruments, diesel loco parts, fasteners, bearings, etc. 12can of 350 gm. each are packed in one corrugated box. products and services to its customers globally. speeds or other extraordinary stresses exceed the performance limits of conventional lubricants. Products from ISOL are also ideal for normal service lubrication. Our product range includes Silicone High Vacuum Grease, Gas Valve Grease, Electrical Contact Cleaner, Specialty Greases & Maintenance Sprays, Silicone Emulsion, Silicone Spray etc.